It took a couple of weeks but I finally was able to see the Angelina Jolie-directed and let me just say straight off the bat that is was pretty good.I didn't know she had it in her to do such a heartfelt movie, so props to her. Unbroken is about a soldier who gets captured in a Japanese Prisoner of War camp and you get to see all the hardships he goes through. With a strong heart and tough situations surrounding him, he makes it out alive and chooses to forgive his captors in the end after the war is over. 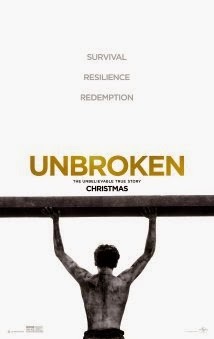 Unbroken is based on the life of Olympian Louis Zamperini, an Italian American who, as a child, was a little trouble maker and used his legs to avoid getting caught. His older brother notices he's got a talent and has him try out for his local school track team. Several years pass, he's so good to attend the 1936 Summer Olympics in Berlin, Germany. It didn't show if he placed well or not in the Olympics, but I found he placed 8th in the 5000 meters and had the fastest lap time of 56 seconds. This caught the attention of Adolf Hitler, who would later shake hands with Louis just years before the beginning of the second World War, in which Louis fights the Japanese. The theme throughout the movie is about not worrying or panicking and looking at the situation you're in and making the best of it. While flying over the Pacific, Louis and his comrades survive a plane crash and are stranded in the middle of the ocean with few supplies. Louis is smart and rations what they have. When they finally run out after a few days, his crew does something crazy to survive. Guys will think it's cool and girls will probably be grossed out. The hardships continue, however, when Louis is capture by the Japanese. You see his whole life story and what a tough life it was during the war. I enjoyed this movie and the strong characters introduced. Angelina does a great job and I'd go see the next movie she directs for sure.